In case you haven’t noticed, I’m on a dyeing kick! 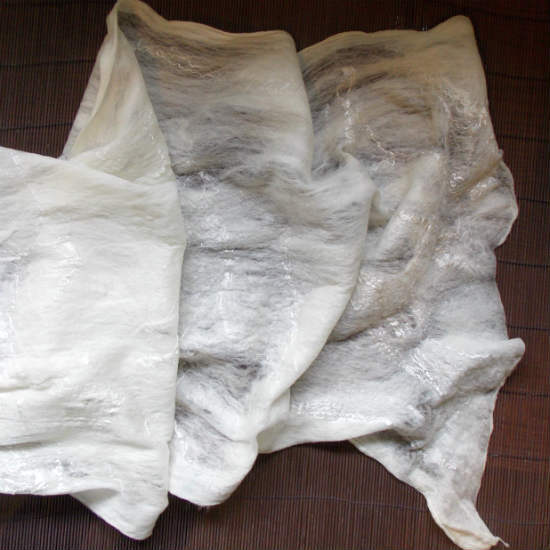 Specifically, Shibori Dyeing. Unfortunately, I’ve had to rejoin the ‘real world’ and get a ‘real job’ (meh!) so I don’t have as much time to play and blog. That’s ok, though, it’s a good thing. And I’ll share as many of these goodies with you guys as I can. 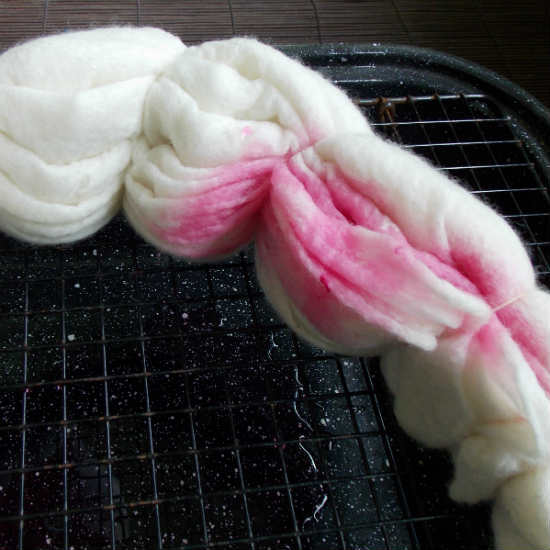 Part 2 of the Shibori Series is a technique called Suji Dyeing. It’s pretty simple, really, but can produce some beautiful results! I dyed one of my cobweb felted shawls (See the tutorial here) but you can use any wool, alpaca, mohair or silk fabric. I cobweb felted a shawl (like this) using fine, white Wool Roving , Silk Roving or Sliver and some Angelina Glitz for a bit of sparkle. 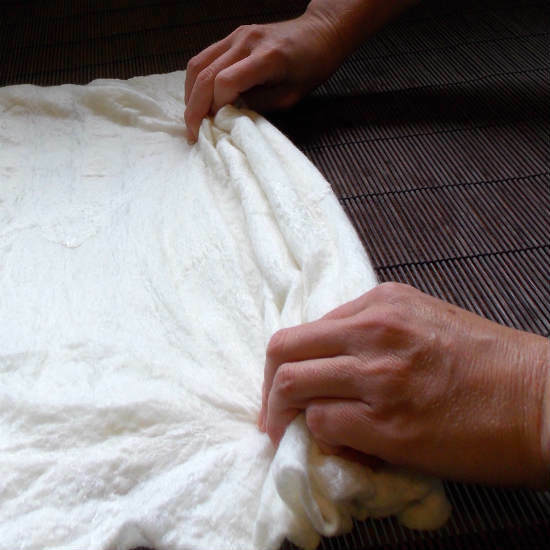 First thing you have to do is prepare your shawl by soaking it in warm vinegar for about 30 minutes. 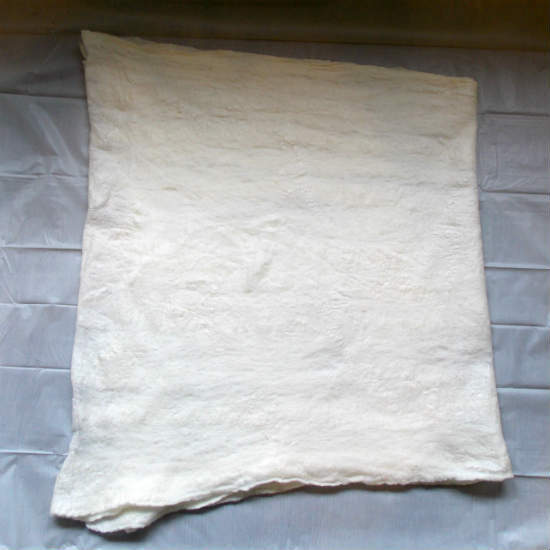 The vinegar changes the PH and allows the dye to bond with the fabric and make it wash-fast. Squeeze out the excess vinegar and lay your shawl flat. Now we fold. I folded my shawl in half lengthwise and then folded it lengthwise again. Next, I carefully accordion folded it. 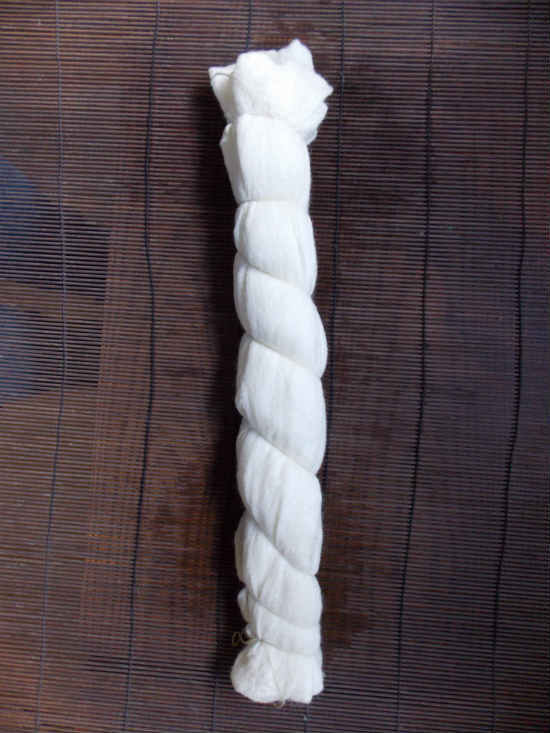 Tie the string at one end and then tightly wrap it around the length of your folded shawl. Now you’re ready to dye. Mix up your dye according to package directions. At first I thought I would paint the dye on …. but then I decided it would be better to submerge the fabric in the dyestock to better penetrate the layers. Set your dye by steaming or simmering according to the dye directions. Let cool and rinse well. What do you think? You like?? 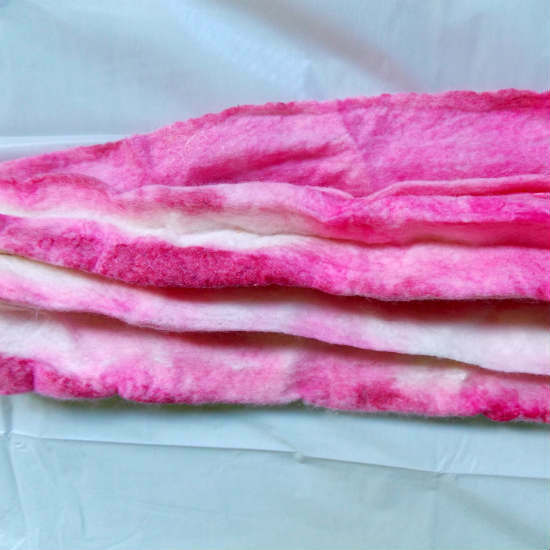 What Dyeing Techniques have you tried? This is so creative and functional! You brought me back to my tie dye days as a kid. 🙂 Thanks for sharing. That really turned out pretty! Going to have to give this a try! This looks like fun and the results re very cool. I bet my Home Economics students would have loved to do this! Very pretty! I know a bit of people who like to dye things like this. I’ not much of a shawl or scarf person, but you made this look really pretty. 🙂 I think my oldest would love something like this, but in green.